From its very beginnings modernity could be described as a social formation which values innovation. It embraces the production of new ideas, practices and technologies. The task of innovation, however, was usually carried out by specialized experts (inventors, researchers, and developers) in specialized areas (laboratories of universities, research centers, and R&D departments). As long as only a small sector of society engages in innovation it might be an exaggeration to speak of modernity as an innovation society, but in the light of recent developments the diagnosis of an innovation society is gaining new plausibility. Innovation has become heterogeneously distributed, ubiquitous, and reflexive: Innovation is increasingly produced by decentralized networks which involve actors from divergent social fields. Innovation therefore leaves the traditional sphere of the restricted laboratory and is transformed into an ubiquitous practice which is also adopted by non-professional as well as non-commercial actors like sports enthusiasts (Baldwin, Hienerth & von Hippel, 2006), private tinkerers (Baldwin & von Hippel, 2011), or „innovation communities” in general (von Hippel, 2006: 96). Hence, the growing knowledge about innovation also leads to a reflexivity of innovation itself (Hutter et al., 2011: 2), extends the scope of innovative practices, and transforms the very processes and structures of innovation: findings from the fields of open source software (Raymond, 2001; Kogut & Metiu, 2001), crowdsourcing (Brabham, 2008; Howe, 2010), or the modes of open-/user-based innovation mentioned above show evidence for these broader transformations. According to Østergaard et al. (2013) innovation nowadays is primarily network-driven, structured by new modes of communication, interaction, and production that have emerged from the internet. It is increasingly acknowledged that innovation is not something that happens inside organizational boundaries, but rather a complex social process that transgresses the borders of labs and R&D departments. Since Castells’ description of the “Rise of the Network Society” (Castells, 1996) the diagnosis of a transformation of social structures in reaction to the emergence of new media of communication has become commonplace in the social sciences (Baecker, 2007 & 2011). One important feature of our innovation society is its hyper-complexity. Society has reached a stage of complexity which makes it impossible to predict complex social developments (like market developments). Inter alia, this is because of an ongoing differentiation of individual values and preferences, the formation of new forms of interaction and “crowd” behavior, and a growing technological infrastructure that supports the rapid diffusion of ideas in an unprecedented way. These technological and cultural changes challenge the central role of the organization as the center of innovation. In the economic literature, Coase (1937) asked the question why firms exist in the first place (and not just markets). He reconstructed the function of the organization in the economic sphere as a medium to decrease transaction costs. Within the boundaries of the organization complexity is reduced, and a common pool of resources and knowledge is established. Innovation as a social process is more likely if several experts with specialized skills come together under the umbrella of an organization. Organizations allow for a coordination of innovation practices. With the rise of the Internet a different medium of coordination has emerged. Not only has it become possible to interact with people across the globe, but also to share ideas which might contribute to the emergence of an innovation. To gain access to the expertise that is desired and needed for innovation practices (but located outside of the organization) is much easier nowadays (Lakhani et al., 2013). It has also become evident that people without formal and certified expertise (Collins, 2002) might contribute to innovations and that the “Schumpeterian momentum” noticeably shifts from the producer to the customer (Grabher, Ibert & Flohr, 2008: 255). All of these dynamics signify recent organizational reactions to the network-based paradigm that, from the perspective of a focal enterprise, is generally summarized as “open innovation” (Chesbrough, 2011). The “rapid increase in the number of citizen science initiatives” (Roy et al., 2012: 9) demonstrates that, even in science, a social sphere that is traditionally defined by a clear boundary between (organized) expert knowledge and lay knowledge, the power of “boundary-spanning processes” (Hoffmann, 2012) is increasingly recognized: On the platform zooniverse alone over a million volunteers participate in scientific projects via crowdsourcing. Other projects like foldit utilize the creativity of users through an online game that encourages user to discover new protein structures (Haklay, 2013). The International Genetically Engineered Machines Competition (iGEM) – an important event in the field of synthetic biology – is now even opening its doors for teams of do-it-yourself biologists (http://diybio.org/2013/11/06/diy-igem/). In parallel to (and partly in conjunction with) the opening of organizations and expert communities, new figurations of actors have appeared who share knowledge and information outside organizational boundaries. They invent and create, first and foremost, without being motivated by money. Open Source Software like Linux and novel modes of knowledge generation like Wikipedia are the prime examples of this new mode of decentralized and hierarchy free “peer production” which is defined as “decentralized, collaborative, and nonproprietary; based on sharing resources and outputs among widely distributed, loosely connected individuals who cooperate with each other without relying on either market signals or managerial commands” (Benkler 2006: 60; see also Al-Ani, 2013). Peer Production depends on self-selected and heterachical practices: People do contribute to platforms like Wikipedia because they want to (for whatever reasons), not because of a hierarchical directive. Decentralized peer production is nothing completely new. By drawing on examples from the 19th century, Allen (1983) and Nuvolari (2004) coined “collective invention” as a similar mode of commons-based collaboration between companies who share their knowledge and expertise in joint innovation processes. Also, “Science is built by many people contributing incrementally – not operating on market signals, not being handed their research marching orders by a boss – independently deciding what to research, bringing their collaboration together, and creating science. What we see in the networked information economy is a dramatic increase in the importance and the centrality of information produced in this way” (Benkler, 2006: 63; see also Gläser, 2006). What Benkler emphasizes with his notion highlights the wider inclusion of actors, which is facilitated by information technology that unleashes potentials of local, temporal, and cultural diversity. In this paper we will contribute to the discussion on new forms of innovation and production by focusing on one further similarity of current forms of peer production and science: experimental practices. Following recent discussions on real-life experiments in science and technology studies, we will argue that experimentation is an important feature of innovation practices. Just like innovation, experimentation has also become a ubiquitous, heterogeneously distributed and reflexive practice. Especially in the recently emerged community- and peer-based forms of production, the freedom to experiment plays a major role. In contrast to the limitations of experiments embedded in hierarchies and the imperatives of formal organizations, peer communities provide settings where actors are primarily intrinsically motivated and free to join and leave these communities and this is likely to cause an increased freedom to experiment. We suggest that experimental practices are not something that happens in addition to other things going on in peer production contexts, but that peer production itself is a real-life-experiment in societal transformation. The transformation of society by means of peer production is a guiding vision of some authors engaged with new forms of collaboration. They suggest that the very logic of capitalism might be transformed by this mode of coordination. However, so far the most notable success stories in terms of transformation (Wikipedia and Linux) are limited to the digital realm. One important precondition for the growth of peer production beyond the digital realm is the connection of decentralized collaboration in digital networks with material forms of production (Bauwens, 2005; Zuboff, 2010). With the current focus on the importance of networks and digital media it is easy to forget the relevance of physical spaces of innovation. But, especially when the result of a coordinated effort is not an immaterial good but something tangible (like a piece of hardware), physical infrastructures and material resources beyond digital platforms are necessary. The existence of science could be interpreted as a proof of concept that the links between decentralized information networks (publications) and sites of engagement with material objects (laboratories) could be established. We therefore introduce the concept of real-life laboratories as new places for experimental innovation practices in contexts of peer production. Shared machines shops (SMS) are a perfect example of these new laboratory spaces. They embody the values of ubiquitous, heterogeneously distributed and reflexive experimentation. They provide new laboratory infrastructures outside of hierarchical organizations while being embedded in the digital and fluid networks of a new experimental culture. However, like social studies on laboratory life have shown, the boundaries between the laboratory and the rest of society are not absolute (Latour, 1983). We use two examples of innovations in shared machined shops (low-cost-prosthesis and open hardware 3D printers) to demonstrate that peer production as a new form of innovation is still in a fragile niche phase. It is surrounded by an innovation regime that implicates commercial logics and patterns of market regulation and thus reveals tensions with the particular practices of experimental exploration which are constitutive for the open and community-based approach of SMS. Shared machine shops like FabLabs, TechShops, maker- and hackerspaces are relatively new phenomena. As this special issue demonstrates, these workshops are currently a rather “hot” topic. They are framed as nuclei of collaborative grass-roots fabrication that could revolutionize and democratize manufacturing or may even replace capitalist patterns of production and consumption (Smith et al., 2013: 4). But are shared machine shops actually the constitutive elements of a new industrial revolution (Anderson, 2012), or will they remain idiosyncratic niches? We think that it is still too early to answer a question like this. Maybe the question itself is wrongly phrased. In this paper we will offer a different perspective on shared machine shops. These workshops can be taken as experimental settings where new visions, practices, and technologies are developed, tested, and refined. SMS are laboratories of a new kind. These laboratories are neither detached from society, nor are they only accessible for professionals. Instead, shared machine shops are real-life laboratories. In the following section we will elaborate on this concept. Experiments are a defining feature of modern science (Hacking, 1983; Pickering, 1995; Rheinberger, 2002). In the scientific worldview, not the study of ancient traditions, but the inquiry of nature by means of experimentation is regarded as the most suitable path to knowledge. The paradigmatic place of experimentation is the laboratory, a special setting constructed for the performance of experiments. In the traditional, truth-seeking form of knowledge production, labeled “mode 1” by Gibbons et al. (1994), the function of the experiment was the construction of facts – and the function of the laboratory was the “purification” of this construction (Latour, 1993). Local observations in these controlled settings form the basis for the generalization of facts which can be transferred to the outside world. As long as the central goal of science was the pursuit of truth, the boundaries of the laboratory could hardly be solid enough in order to exclude outside influences which might contaminate the experiment and would hamper insights into cause and effect relationships. In innovation society this mode of knowledge production has been displaced by more context-driven and problem-focused projects. In this so-called “mode 2” (Gibbons et al., 1994) of knowledge production, experiments often take place outside controlled settings – or even beyond purely scientific contexts. It might be wrong, however, to identify experiments with pure (or purified) science in the first place. In his analysis of the relation between experiments and modernity, Krohn (2007) has shown that the semantics of experimentation can be found in heterogeneous contexts of modern life such as experimental literature, wars (as contexts for the experimental use of new weapons) and experimental forms of urban development. In all these contexts the term “experiment” is used to designate systematic learning practices by means of specific technical or social installations. Learning is not used as a normative term here, but as an analytical concept. Learning occurs if individuals or social systems break with established routines and create something new. Learning makes use of “irritations” that change the “usual way of processing information” (Mölders, 2014: 2). In experiments, social, technical and/or natural conditions are ordered and arranged in a specific way to encourage this kind of learning from irritations, and hence the establishment of new routines. It is this systematic approach to learning by means of remodeling (material or immaterial) conditions that distinguishes experiments from those practices of trial and error that occur in everyday life on a regular basis, and sometimes even unintentionally. Experiments allow it to try something new and risky, and to accept the occurrence of failure. Furthermore, experimental settings make it possible to learn from those mistakes in a systematic manner. Experiments, therefore, combine an amount of freedom and control not usually found outside experimental settings. Krohn notes that Darwin’s evolutionary theory of variation and selection might suggest that nature itself is experimenting (Krohn, 2007: 346). This, however, confuses the categories of evolution and learning. Evolution is blind; learning is the result of reflection (Mölders, 2011). Evolution produces variations bottom-up, without intention, planning, or control. Learning can also occur spontaneously, but – especially in modern society – we can observe the emergence of institutional orders that aim to encourage learning, like laboratories or classrooms. While not only natural change, but also social change is mostly the result of evolution, in modernity learning has become an important alternative mode for the production of variations, of new ways of doing things that break with established routines. Also experiments, those special techno-social arrangements for learning, now take place in many different social contexts (Krohn, 2007). In innovation societies the need for experimental learning has widely increased. In cases like genetic field experiments, prototyping in research and development, or beta releases of software products, experiments become real-life experiments (Krohn, 2007; Groß et al., 2003): Real-life experiments take place outside scientific laboratories. They don’t follow the logic of isolation and purification of laboratory experiments and typically include actors outside professional scientific contexts. Their objective is not the generalization of natural laws but the exploration of specific cases (Krohn, 2007: 349-354). Groß even suggests that nowadays controlled laboratory experiments have become the exception, while real-life experiments have become the norm (Groß, 2013: 196). While experiments might have left the closed spaces of scientific institutions, the world outside these institutions is also changing. Krohn and Groß suggest that society itself turned into an experimental setting that itself begins to resemble laboratory life (Groß & Krohn, 2005). Laboratories in contexts of research and development are institutional spaces that create a boundary between science and society. What happens in laboratories should not bother the rest of society – and vice versa the outside world should not be bothered by the small socio-technical world of laboratory life. The world inside the laboratory becomes “a world on probation” (Krohn, 2007: 348, translated by the authors). But even in the world of pure science this boundary between the inside and outside world is fragile, as science studies have shown (Latour, 1983). On the basis of the more general notion of experiment developed above, the concept of the laboratory can also be expanded. Laboratories are not only closed rooms detached from the rest of society, they can be all kinds of (more or less protected) spaces in which the arrangements necessary for experimentation can be installed. Hence, laboratories are not only places in which facts are produced and reproduced but also – and maybe foremost – places that facilitate installations and constellations which enable irritation and learning (which again may or may not form the basis of new facts). This more open understanding of laboratories can be traced back to the Chicago School of Sociology and is currently revitalized in science and technology studies as well as in environmental science (Latour, 1983; Groß & Krohn, 2005; Schneidewind & Scheck, 2013). In environmental science the concept of real-life laboratories (Schneidewind & Scheck, 2013) was recently developed to describe semi-protected spaces that are established for experiments between knowledge generation and knowledge application; where new kinds of socio-technical practices are developed and tested. A real-life laboratory is neither a closed room, designed to control all relevant experimental boundary conditions, nor a borderless space like “society”, “the market” or the “internet”. Real-life laboratories instead create a semi-open spatial and social microcosm, where failures are allowed, irritations are welcome, and learning is encouraged. An important feature of real-life laboratories is their transdisciplinarity and openness. Not only certified experts can gain access to these places. They are rather spaces that encourage the interaction of experts and so-called “lay persons”, who might indeed be (uncertified) “experts” as well and who can contribute to ongoing real-life experiments. In the closed space of traditional laboratories in universities and R&D departments of firms, the presence of these non-certified experts would usually not be allowed (at most as “subjects” of an experiment or “visitors” to the laboratory) and their knowledge would be excluded from the processes of innovation, experimentation and collaborative learning (Collins & Evans, 2002). In their study of research “in the wild”, Callon and Rabeharisoa (2003) have shown that there is no intrinsic difference between expert knowledge and lay knowledge. “It would, for example, be wrong to say that the former are explicit and codified while the latter are tacit, or that the former are formalized while the latter are informal. Everything depends on the equipment used on both sides and, more broadly, the conditions “in which the expertise is produced” (ibid. : 196). Real-life laboratories can be conceived as laboratories “in the wild” in which the boundaries between expert and lay knowledge can get blurred even more, because real-life laboratories might provide the equipment and conditions for knowledge production typically associated with the world of scientific expertise. Nevertheless, it is important to keep in mind that real-life laboratories are not designed for purification purposes. They are laboratories with a different function than traditional scientific laboratories: In the context of innovation society real life-laboratories provide niches for path-breaking innovations. The concept of niches was developed within an evolutionary multi-level perspective on innovation and transition (Geels, 2011; Geels & Schot, 2010). It highlights the importance of hegemonic socio-technical regimes as selection environments for innovative variations. They constitute stable and dominant ways of realizing societal functions. These regimes form the ‘deep structure’ of socio-technical systems. They can be understood as interrelated social rules and routines, cultural beliefs and practices and technical infrastructures that guide the activities of policy makers, market actors, and engineers alike (Geels, 2011: 27; Smith et al., 2010: 441). Regimes encourage incremental innovations along certain paths, but create structural disadvantages for path-breaking innovations and therefore limit forms of learning. Niches provide spaces where new ideas and technologies are developed while being (partially) protected from the dynamics of the current socio-technical regime: Niches shield path-breaking innovations against the selection pressure of the regim, and they nurture these innovations through the (1) articulation of expectations and visions, (2) the building and expanding of social networks, and (3) the encouragement of learning on technical, economic, political, and cultural dimensions (Smith & Raven, 2012: 1026–1030; Geels, 2011: 28). The more the focus of niches is on learning, the more the function of niches as an experimental setting comes to the fore. In the recent literature on real-life laboratories, those settings are typically understood as rather large entities like cities, regions, or organizations (Expertengruppe „Wissenschaft für Nachhaltigkeit“, 2013: 16). In our paper, however, we apply the concept to places whose scope and design is closer to traditional laboratories: shared machine shops like hackerspaces, makerspaces, FabLabs and TechShops. Our understanding of SMS as real-life laboratories is based on a document analysis of the self-descriptions of different types of shared machine shops, interviews with participants and exploratory field observations. If applied to large and more or less unbounded areas like cities, the concept of the real-life laboratory might remain a rather metaphorical description. In contrast to this metaphorical usage, shared machine shops are defined by specific locations. They are places with a distinct identity shaped by experimentation, innovation, and learning. However, unlike traditional laboratories, SMS are not integrated into an organizational hierarchy and they embody the blurring of boundaries between experts and lay persons (or – following Collins and Evans (2002) – certified and non-certified experts). In the case of SMS the latter could, for example, be students, hackers, makers, and hobby inventors. Shared machine shops can be understood as real-world laboratories that develop and test not only new technologies but also new practices in the dimensions of creativity, sustainability, and inclusivity (Smith et al., 2013: 5–6). They are laboratories for (technical and social) innovations, where design ideas can be shared, a hands-on mentality can be cultivated, and new skills can be acquired. They might also be places of serendipity, where experts and professionals meet with hobby enthusiasts and DIY innovators and work together on new, unexpected projects. In some cases sustainability is an explicit goal of such spaces. Technologies of digital fabrication like 3D printing (which is constitutive for FabLabs and TechShops and commonplace in maker- and hackerspaces) are often framed as green technologies, because of the additive production process and the possibility to produce goods locally. Furthermore, shared machine shops might engage in recycling and upcycling of products, and subscribe to post-consumerist values. Shared machine shops can also foster a more inclusive form of innovation and production, and give marginalized parts of the population access to tools and networks; hence, they are also associated with hopes for user empowerment (Smith et al., 2013: 5–6; Dickel, 2013; Walter-Herrmann & Büching, 2013). It is still unclear which of these promises can really be fulfilled by shared machine shops, but maybe this is not entirely the point. If we think of SMS as real-world laboratories it is not so important if the shops themselves are already decentralized factories of a new kind with perfectly sustainable and inclusive modes of production that must only be up-scaled. If we take a step back and view them foremost as real-world laboratories it is more important to systematically learn from the practices in these workshops. Learning from their successes can therefore be as important as learning from their errors. The multidisciplinary communities and networks which connect these workshops at local, national and transnational levels can then not only be framed as an emerging (maker) movement but also as a new “experimental culture” (Rheinberger, 2002: 149–150), a networked community which inspires the ways in which new laboratories are constructed, reflects on the experiments made, and may change and adapt them if necessary. The creation and alteration of shared workshops can then be understood as a second order experiment: a large scale experiment where every real-life laboratory is itself a unit of experimentation. How the results of these experiments are used, however, may easily escape the sphere of influence of the laboratories. Will the ideas, technologies and practices developed in shared machine shops be integrated in the existing regime of production, or may they serve as blueprints for a new socio-economic regime? This leads to the question of empowerment, a third function of niches (besides shielding and nurturing) which was recently analyzed by Smith et al. (2012). The authors understand empowerment as practice that increases the competitiveness of innovations when they are brought into the world outside the niche. Empowerment can be realized in two ways: (1) by adapting the innovation in a way that conforms to the rules of the regime, or (2) through a restructuring of the regime that surrounds the niche. Shared machine shops constitute a new environment for exploration in various fields of technology- and design-related topics that, compared to the mode-1-laboratories mentioned above, reveal unique properties: Since these workshops are typically organized around community-based principles (one has to consider TechShops as a commercial exception here), participation depends rather on common interests, shared values, and intrinsic motivation than on disciplinary boundaries and professions. Following this approach, shared machine shops offer new opportunities for collaboration and co-operation among heterogeneous actors that contribute their particular expertise and visions to any given context of shared interest. This often causes creative friction, which may either lead to small-scale inventions that serve the personal needs of its inventors, but in some cases also fosters solutions that could gain innovative momentum outside the shared machine shop, and beyond the initial motivations of the actors involved. Based on a secondary analysis of two different inventions which have their origins in hackerspaces and FabLabs, it shall be shown how this particular background has shaped the path for these inventions. Rather than making strong empirical accounts, this analysis illustrates how the notion of real-life laboratories serves as a fruitful concept to explain the distinct settings and constellations in the sketched niches for innovation. Both, the case of low-cost-prosthesis as well as the one of Makerbot recently gained some broader public interest. They represent examples for a whole bunch of inventions developed in SMS and show some of their most significant material traits and organizational backgrounds. The first case we want to introduce as an evidence for the conceptual aim of this paper is the one of “low-cost prosthesis”. Building on a collaboration between Amsterdam’s FabLab, the Indonesia-based House of Natural Fiber (HONF), which is a media and art laboratory in Yogyakarta as well as its associated FabLab (the “HONFablab Yogyakarta”), this project incorporates the principles of the FabLab Charta quite perfectly as it really draws on networking among different Fab-Labs, open knowledge sharing, and free access to community resources (http://fab.cba.mit.edu/about/charter/). The general aim of the low-cost prosthesis project is to explore how a developing country like Indonesia can become self-reliant in building prostheses for the cost of about $50. The need for this endeavor is obvious (see: http://www.lowcostprosthesis.org): First, due to the increasing rate of amputations, there is an ever-growing demand for prosthetic limbs especially in developing countries where insufficient supplies of public health services often leads to diabetes, gangrene, and infection. Second, there are significant problems in providing prosthetics to people in need due to the high cost for readily available prosthetic limbs, and the lack of expertise, which is mandatory for proper constructing, fitting, aligning, and adjusting of prosthetics. To offer a solution for this pressing problem, the low-cost prosthesis project started to develop a lower knee prosthesis by approaching an inclusive open innovation process, where end users, designers, researchers and manufacturers can contribute in a joint effort (Waag 2009). The current state of the project is reflected by a prototype of the “$50 leg prosthesis” (see fig. 1) which was developed in 2012 after several workshops with experts from various related fields (e.g. rehabilitation, biomechatronics, biomedical engineering, orthopedic technology, design etc.). 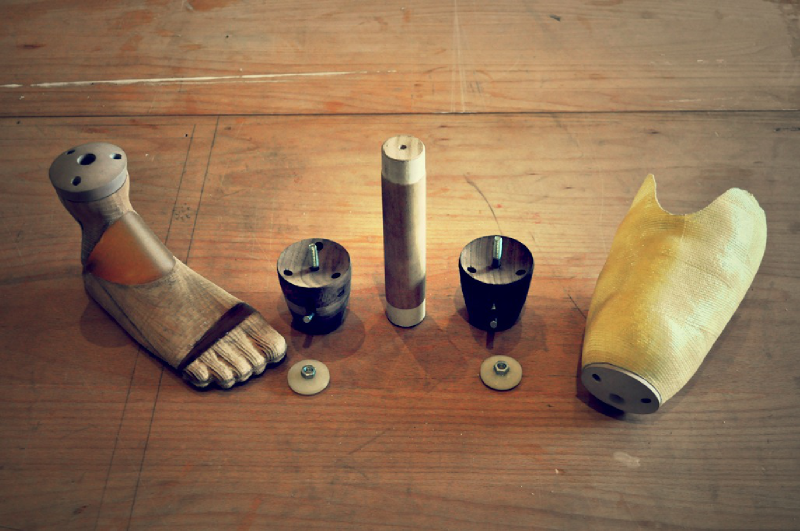 Since the development of the low-cost prosthesis is still in its experimental phase, this solution is shielded in the niche of the FabLabs, which are engaged in this project. Nevertheless, the potentials to spread the orthopedic as well as construction-related knowledge and to empower the locals by creating new jobs at the same time are already obvious. Besides that, it also captures the very specifics of the experimental learning processes which we consider to be constitutive for the concept of real-life laboratories. Especially the documentation of workshops that were conducted during the project reveals this evidence. As mentioned above, these workshops were attended by experts from various professional disciplines as well as people who got engaged because of their FabLab background. This constellation apparently provided a fruitful setting for e.g. “an exchange of experiences by users on the techniques and the use of materials” or “the search for local materials, a number of design aspects, and an inexpensive and efficient production of quality parts that could raise the comfort of use” (Waag, 2009). This process of co-creation in connection with a social approach to design and manufacturing probably needs the niche of the FabLab, where failures are allowed, and visions are welcome. Since the project also builds on low barrier technologies (like digital fabrication), local materials, and DIY kits, the particular characteristics of decentralized and hands-on innovation development processes that are typical for shared machine shops also facilitated the work and progress of the low-cost prosthesis project. The second case we want to draw on is the one of Makerbot, Inc., which today is one of the leading companies for desktop 3D printing. Tracing back the origins of Makerbot shows that the company’s roots are strongly linked with the RepRap Project, which started in 2005, and was motivated by the aim of developing self-replicating 3D printers that are able to print most of their own components, as well as any other object that can be represented in 3D modeling (see: http://reprap.org). From its beginning, RepRap was intended as an open-source and community-based project that tries to apply an evolutionary approach to the development and diffusion of a technological device (Söderberg, 2013). It also aims to include as many people as possible to spread the idea and the physical printers (Jones et al., 2011). Although some online shops sell kits for RepRaps, usually community members who already own a printer produce all the printable parts for new members just for the cost of the raw materials. Open access to any sources of knowledge that are required to rebuild and further develop the RepRaps is thus the key condition of its diffusion. Today, there are more than 400 derivatives of 3D printers that are descended from the initial RepRap “Darwin”. Furthermore, the various types of RepRaps together apparently represent the most common application of desktop 3D printing. Both facts reveal the innovative potential of RepRap as an open source hardware project that is driven by the communal logic of shared values (i.e. the hallmark of open knowledge), the common belief of being at the edge of a new technological path creation, and a collective identity that is shaped by various mailing lists, online forums and – last but not least – face-to-face meet-ups at conferences, hacker-, and makerspaces. Especially this early work on prototypes and design-iterations can be considered as real-life experiments. This becomes even more obvious by the description of the development process of makerbot’s first printer, the so called “Cupcake CNC”: “At that point, very early on, within the first month, we made a commitment to using the laser cutter we had at NYC Resistor. What that allowed us to do was proto-type ultrafast. […] And we could iterate as we learned. […] We weren’t engineers, but we iterated and designed a 3D printer in less than three months and it worked, and so we shipped it” (Osborn, 2013: 248). This hands-on approach of experimental learning is one of the central impacts which can be enabled by real-time laboratories and the particular resources they offer. What followed to this early proof of concept with the “Cupcake CNC” was an entrepreneurial success story that began with the move into an own office, several new incarnations of the initial Cupcake CNC and a newly developed 3D printer called “Thing-O-Matic,” which already triggered a growing public interest. With the acquirement of $10 million in venture capital from an investment group, Makerbot entered a second phase in its evolution, one which was mainly affected by growth in organizational size and increasing sales numbers. Supported by the monetary investment, the company launched the 3rd generation printer “Replicator” with a huge medial response that catapulted the company to the forefront of the 3D printing industry. The increasing commercial success of Makerbot was accompanied by a subtle de-coupling with the RepRap Community. This process became definite with the product launch of the improved “Replicator 2”: On the one hand, this new incarnation seemed to be the logical next step in Makerbot’s rise, as it made 3D printing even more accessible for users who don’t have in-depth technological expertise, but on the other hand the Replicator 2 revealed the company’s decision to stop sharing its design files for the printer anymore, that finally broke with the core principle of the RepRap ideals. In June 2013, Makerbot was acquired by one of the leading factories of professional, industry-based rapid prototyping and manufacturing called “Stratasys” for more than $400 million. The two cases show how FabLabs (in the case of low-cost-prosthesis) and hackerpaces (Makerbot) respectively provide niche protection by shielding and nurturing novel designs or technological artifacts (Smith & Raven, 2012). As these environments offer a semi-open space for experimental learning, people who share interests and/or visions about a specific context for exploration can participate in a particular project, without being reliant on the criteria for professional or commercial research and development (like e. g. appropriate exploitation strategies, scientific standards etc.). But even though the SMS-related processes often depend on semi-professional tinkering and trial-and-error learning, it also becomes obvious that these environments can foster the momentum for innovation paths that emerge on the basis of their developments and also stimulate some considerable impact when it comes to diffusion. What makes this linkage between exploration and exploitation (or diffusion) special is that its dimensions often resemble the heterogeneous constellations of the initial inception: in most cases, they cannot be reduced in terms of commercial success since they also refer to social and environmental ambitions as well. Referring in this point to Smith and Raven’s (2012) notion that the empowerment of niche-developments can be considered in terms of paths that either “fit and conform” or “stretch and transform” existing regimes (ibid: 1030), the two cases described above tend to emphasize this contrast. As an example of the “fit and conform” option, the rise of the Makerbot 3D Printer which was invented in a hackerspace and now has become one of the most popular applications in the field of desktop 3D-printing clearly indicates evidence for this. This becomes obvious when the market strategy of the associated company, Makerbot Inc., comes into focus. In the initial phase of the company’s entrepreneurial success, the Makerbot Printers were open source devices in the sense that documentations about their design specifics, list of materials and building tutorials were revealed freely so that (in principle) anybody was able to build his own Makerbot printer from scratch. In connection with referring to the company’s roots in hacker communities, this unique approach of founding a business model for a hardware-/tech-company on open source principles, on the one hand, triggered a considerable medial response that catapulted the company to the forefront of the 3D printing hype, and, on the other hand, made it possible that Makerbot received much support from the open-source and hacker communities, be it in the form of suggestions for further improvements of their devices, or in the form of product purchases. It is a matter of irony that this high extent of openness which led to the company’s increasing commercial success became a problem at the same time, as the free revealing of product blueprints apparently weakened Makerbot’s competitiveness in the emerging market for desktop 3D printers. As a consequence of this dilemma, Makerbot decided to break with the principles of its former communities and respond to alleged market pressures by closing the source for product-related knowledge and switching to a more sophisticated style of manufacturing (which meant that building Makerbot printers requested access to industry-like machine tools). To summarize this switch in the path of the technological artifact as well as the company’s strategy, it can be inferred that both reveal ambitions of fitting and conforming the requirements of the market regime, which favors a more commercial and competitive way of doing business, even if this limits the openness and uniqueness of the associated product and business model. The fact that Makerbot was acquired for a large amount of money only a few months after this turn can be considered as an endorsement for this decision, at least from a business point of view. In contrast to the case of Makerbot, the low-cost prosthesis project apparently aims to “stretch and transform” the existing regime for prosthesis supply in developing countries. We have to admit that this notion is rather speculative as the project still remains in its protective nurturing phase. Nevertheless, there are already a couple of hints that this transformative path can be expected. First, there is the constitutive aspect of cost: as stated on the project’s homepage “A typical limb made in a developing country costs approximately $125 to $1,875 USD. Our project aims at cutting the costs to as little as $41 USD (well below the $5,000-$15,000 USD average cost for a prosthesis in the western world)” (http://www.lowcostprosthesis.org/the-need). It becomes obvious that the main motivation for the low-cost prosthesis cannot be measured in terms of business criteria like e. g. monetary revenues or margins, but rather refers to ethical and social values which probably don’t reflect the common references in established fields of medicine technology and its distribution. Second, there is the strong ambition to spread orthopedic knowledge and enable locals to become skilled actors when it comes to the fabrication and adjustment of the prosthesis. This approach to knowledge transfer is important for the empowerment and self-reliance of the prospective users and blurs established boarders between experts and laypeople (Middel, 2011: 218-219). Third, there is also a claim to sustainability which shall be realized by using local materials like e. g. bamboo instead of aluminum. These aspects show that the overall approach of the project is strongly aligned with the needs of local communities. In terms of conventional research and development, this way of creating a novel prosthesis appears very unique. It is very likely that the diffusion of the prosthesis will extend this path which may also stretch the regime for medical health supply in a more general way. Our paper applies the concept of real-life laboratories to SMS. These spaces provide niches for experimental learning that expand the scope of established modes of research and development which are predominantly embedded in professional contexts of industry or science. As a specific property, SMS have a capacity for inclusion because they provide infrastructures for novel forms of collaboration as well as self-selected participation of heterogeneous actors (in terms of expertise, disciplines, backgrounds etc.) who can join the related endeavors. The cases discussed also reveal an ambivalence of real-life laboratories like SMS. One the one hand they provide a protective space for potentially path-breaking innovations. On the other hand they aren’t closed spaces of scientific purification but are linked to the “real life” – including its economic pulls and pressures. This ambivalence between closedness and openness can never be suspended in real-life laboratories. It is one of their defining features. Concerning innovative impacts that may emerge from the seedbed of shared machine shops, we identify various aspects that can be inferred from these particular settings and constellations. First, SMS build more evidence for blurred organizational borders between professional, semi-professional, and non-professional modes of innovative action. They embody the values of ubiquitous, heterogeneously distributed and reflexive experimentation and provide new laboratory infrastructures outside of hierarchical organizations while being embedded in the digital and fluid networks of a new experimental culture. Second, the notion of real-life laboratories emphasizes the physical characteristics of shared machine shops as real places where people can join collaborative projects in person. Complementary to the innovative modes of peer production that are embedded in the digital sphere, this offers novel opportunities for the application of related principles in the context of physical fabrication and tangible goods (Troxler, 2010). According to this, SMS are also likely to become places of serendipity, where experts and professionals meet with hobby enthusiasts and DIY innovators and work together on new, unexpected projects. Third, because of the different backgrounds that merge inside shared machine shops, their innovative outputs also typically embody multiple references which refer not only to economic success criteria, but also to social and ecological issues. As shown in the case of low-cost prosthesis, the empowering potentials for niche developments can also be considered as possible incubators for societal or environmental solutions that prove its concepts in the protected space of real-life laboratories and subsequently gain momentum for the creation and diffusion of related paths. Fourth, real-life experiments in SMS are not detached from the rest of society. Hybrid organizations like TechShop or the ambivalent case of MakerBot demonstrate that a decentralized innovation society is increasingly willing to engage in those kinds of experiments for economic innovations (that can also create tensions with more social or environmental orientations). Fifth, in connection with general narratives of openness, participation, and empowerment, the whole phenomenon of SMS itself can be considered as a real-life experiment for novel modes of distributed innovation. Shares machine shops show how experimentation with new technologies and new social modes of coordination lead to niche forms of technical and social innovations. This meso-level of analysis focuses on the future impacts and transformative potentials of shared machine shops as places that are constituted through inclusive, non-hierarchical, and (at least to some extent) non-proprietary modes of knowledge creation. Sixth, the development of new technologies in real-life laboratories – rather than in universities and R&D departments – show that “in the age of technoscience” (Nordmann, 2010) not only the boundaries between organizations and their societal environment, but also the boundaries between science and society get blurred. As Nordmann and Bensaude-Vincent (2011) have argued, it is indeed one of the defining features of today’s technoscientific practices (compared to traditional science) that purification is no longer pursued. Innovations in Shared Machine Shops are congenial to citizen science, though their objective isn’t the construction of truth, but the construction of technology. They can be taken as a novel form of “Citizen Technoscience” (Conz, 2006), or, as we prefer to call it, TechnoCitizenScience, to emphasize how technologically enabled citizens – TechnoCitizens – can change the fabric of networked innovation. Compared to visions that take SMS as forerunners of a new industrial revolution (Anderson, 2012), our interpretation of SMS as real-life laboratories offers a different framing. Innovations in shared machine shops are a step closer to the laboratory “world on probation” (Krohn, 2007: 348, translated by the authors) than to the sphere of production. To expect them to overthrow centralized forms of industrial production might therefore demand too much of these still fragile niches which have to handle the ambivalence between experimental freedom and socio-economic pressures. Al-Ani, A. 2013. Widerstand in Organisationen. Organisationen im Widerstand. Virtuelle Plattformen, Edupunks und der nachfolgende Staat. Wiesbaden: Springer. Allen, R.C. 1983. Collective invention. In: Journal of Economic Behavior and Organization 4 (1): 1-24. Anderson, C. 2012. Makers. The new industrial revolution. New York: Crown Business. Baldwin, C., Hienerth, C. & von Hippel, E. 2006. How User Innovations Become Commercial Products: A Theoretical Investigation and Case Study. In: Research Policy 35 (9): 1291–1313. Bauwens, M. 2005. Peer to Peer and Human Evolution. On “the P2P relational dynamic” as the premise of the next civilizational stage. Online: http://www.networkcultures.org/weblog/archives/P2P_essay.pdf. Baecker, D. 2007. Communication With Computers, or How Next Society Calls for an Understanding of Temporal Form. In: Soziale Systeme 13 (1+2): 407–418. Baecker, D. 2011. Layers, Flows, and Switches. Individuals in Next Society. Online: http://papers.ssrn.com/sol3/papers.cfm?abstract_id=2200791. Brabham, D.C. 2008. Crowdsourcing as a Model for Problem Solving An Introduction and Cases. Convergence: The International Journal of Research into New Media Technologies 14 (1): 75–90. Callon, M. & Rabeharisoa, V. 2003. Research “in the wild” and the shaping of new social identities. In: Technology in Society 25 (2): 193-204. Castells, M. 1996. The Rise of the Network Society. The Information Age: Economy, Society, and Culture Volume I. Cambridge, Oxford: Blackwell. Chesbrough, H.W., Vanhaverbeke W. & West J. (Ed.) 2011. Open innovation. Researching a new paradigm. Repr. 2011. Oxford: Oxford Univ. Press. Coase, R. 1937. The Nature of the Firm. In: Economica 4 (16): 386–405. Collins, H. & Evans, R. 2002. The Third Wave of Science Studies: Studies of Expertise and Experience. In: Social Studies of Science 32 (2): 235–296. Conz, D.B. 2006. Citizen Technoscience. Amateur Networks in the International Grassroots Biodiesel Movement. PhD Thesis. Arizona State University. Dickel, S. 2013. Von der Dynamik des Selbermachens. Nutzergetriebene Innovationen für die Green Economy. In: Ökologisches Wirtschaften (3): 25–27. Expertengruppe „Wissenschaft für Nachhaltigkeit“ 2013. Wissenschaft für Nachhaltigkeit. Herausforderung und Chance für das baden-württembergische Wissenschaftssystem. Report. Ministerium für Wissenschaft, Forschung und Kunst Baden-Württemberg. Online: http://mwk.baden-wuerttemberg.de/uploads/media/RZ_MWK_Broschuere_Nachhaltigkeit_Web.pdf. Geels, F.W. 2011. The multi-level perspective on sustainability transitions. Responses to seven criticisms. In: Environmental Innovation and Societal Transitions 1 (1): 24–40. Geels, F.W. & Schot, J. 2010. The dynamics of transitions in socio-technical systems: A multi-level analysis of the transition pathway from horse-drawn carriages to automobiles (1860–1930). In: J. Grin, J. Rotmans, J. Schot & F. Geels (Eds. ): Transitions to sustainable development. New directions in the study of long term transformative change. New York: Routledge: 445–476. Gibbons, M., Limoges, C., Nowotny, H., Schwartzman, S., Scott, P. & Trow, M. 1994. The New Production of Knowledge. The Dynamics of Science and Research in Contemporary Societies. London: Sage. Gläser, J. 2006. Wissenschaftliche Produktionsgemeinschaften: Die soziale Ordnung der Forschung. Campus Verlag. Grabher, G., Ibert, O. & Flohr, S. 2008. The Neglected King: The Customer in the New Knowledge Ecology of Innovation. In: Economic Geography 84 (3): 253–80. Groß, M. 2013. Keine Angst vor dem Unberechenbaren. Realexperimente jenseits von Anpassung und Resilienz. In: R. von Detten, F. Faber & Ma. Bemmann (Eds. ): Unberechenbare Umwelt. Wiesbaden: Springer Fachmedien Wiesbaden: 193–217. Groß, M., Hoffmann-Riem, H. & Krohn, W. 2003. Realexperimente. Robustheit und Dynamik ökologischer Gestaltungen in der Wissensgesellschaft. In: Soziale Welt 54 (3). Groß, M. & Krohn, Wolfgang 2005. Society as experiment. Sociological foundations for a self-experimental society. In: History of the Human Sciences 18 (2): 63-86. Hacking, I. 1983. Representing and intervening. Introductory topics in the philosophy of natural science. Cambridge, New York: Cambridge University Press. Haklay, M. 2013. Citizen Science and Volunteered Geographic Information: Overview and Typology of Participation. In: D. Sui, S. Elwood & M. Goodchild (Eds. ), Crowdsourcing Geographic Knowledge. Dordrecht: Springer Netherlands: 105–122. Hoffmann, E. 2012. User integration in sustainable product development. Organisational learning through boundary-spanning processes. Sheffield: Greenleaf Pub. Howe, J. 2010. Crowdsourcing. Why the Power of the Crowd is Driving the Future of Business. Online: http://crowdsourcing.typepad.com. Hutter, M., Knoblauch, H., Rammert, W. & Windeler, A. 2011. Innovation Society Today. The Reflexive Creation of Novelty. TUTS-WP-4. Online: http://www.ts.tu-berlin.de/fileadmin/i62_tstypo3/en_TUTS_WP_4_2011_FINAL-1.pdf. Jones, R., Haufe, P., Sells, E., Iravani, P., Olliver, V., Palmer, C., Bowyer, A. 2011. RepRap – the replicating rapid prototyper. Robotica, 29 (Special Issue 01): 177–191. Kogut, B. & Metiu, A. 2001. Open‐Source Software Development and Distributed Innovation. In: Oxford Review of Economic Policy 17 (2): 248–64. Krohn, W. 2007. Realexperimente. Die Modernisierung der ,offenen Gesellschaft’ durch experimentelle Forschung. In: Erwägen Wissen Ethik 18 (3): 343–356. Lakhani, K.R., Lifshitz-Assaf, H. & Tushmann, M.L. 2013. Open Innovation and organizational boundaries: the task of decomposition, knowledge distribution and the locus of innovation. In: Anna Grandori (Ed. ): Handbook of economic organization. Integrating Economic and Organization Theory: 355-381. Latour, B. 1983. Give me a laboratory and I will move the world. In: Karin D. Knorr-Cetina (Ed. ): Science observed. Perspectives on the social study of science. London: Sage: 141–170. Latour, B. 1993. We have never been modern. Cambridge: Harvard Univ. Press. Liedtke, C., Welfens, M.J., Rohn, H. & Nordmann, J. 2012. Living Lab. user-driven innovation for sustainability. In: International Journal of Sustainability in Higher Education 13 (2), 106–118. Mölders, M. 2011. Die Äquilibration der kommunikativen Strukturen. Theoretische und empirische Studien zu einem soziologischen Lernbegriff. Weilerswist: Velbrück Wiss. Mölders, M. 2014. Irritation expertise. In: European Journal of Futures Research 2 (1). Nordmann, A. 2010. A forensics of wishing: technology assessment in the age of technoscience. In: Poiesis & Praxis 7 (1-2): 5–15. Nordmann, A., Bensaude-Vincent, B. & Schwarz, A. 2011. Science vs. Technoscience. A Primer. Version 2.0. Online: http://www.philosophie.tu-darmstadt.de/media/philosophie___goto/text_1/Primer_Science-Technoscience.pdf. Nuvolari, A. 2004. Collective Invention during the British Industrial Revolution: The Case of the Cornish Pumping Engine. In: Cambridge Journal of Economics 28 (3): 347-363. Østergaard, C., Rosenstand, C.A.F., Gertsen, F. & Lervang, J.U. 2013. Into the Surge of Network-driven Innovation. Extending the historical framing of innovation. XXIV ISPIM Conference. Innovating in Global Markets. Helsinki, 16.06.2013. Online: http://vbn.aau.dk/files/77969842/Into_the_Surge_of_Network_driven_Innovation.pdf. Pettis, B., France, A.K. & Shergill, J. 2013. Getting Started with MakerBot. Sebastopol: O’Reilly. Pickering, A. 1995. The mangle of practice. Time, agency, and science. Chicago: Univ. of Chicago Press. Piller, F. & Ihl, J.C. 2009. Open Innovation with Customers. Foundations, Competences and International Trends. Technology and Innovation Management Group: RWTH Aachen. Raymond, E.S. 2001. The Cathedral & the Bazaar: Musings on Linux and Open Source by an Accidental Revolutionary. Sebastopol: O’Reilly. Rheinberger, H.J. 2002. Experimentalsysteme und epistemische Dinge. Eine Geschichte der Proteinsynthese im Reagenzglas. Göttingen: Wallstein-Verl. Roy, H. E., Pocock, M.J.O., Preston, C. D., Roy, D. B., Savage, J., Tweddle, J. C. & Robinson, L.D. 2012. Understanding Citizen Science and Environmental Monitoring. Final Report on behalf of UK Environmental Observation Framework: NERC Centre for Ecology & Hydrology & Natural History Museum. Online: http://www.ceh.ac.uk/news/news_archive/documents/understandingcitizenscienceenvironmentalmonitoring_report_final.pdf. Schneidewind, U. & Scheck, H. 2013. Die Stadt als „Reallabor“ für Systeminnovationen. In: J. Rückert-John (Ed. ): Soziale Innovation und Nachhaltigkeit. Perspektiven sozialen Wandels. Wiesbaden: Springer: 229–248. Schrape, J.F. 2012. Wiederkehrende Erwartungen an interaktive Medien. In: Mediale Kontrolle unter Beobachtung (April 2012). Online: http://www.medialekontrolle.de/wp-content/uploads/2012/04/Schrape-Felix-2012-4.pdf. Shah, S.K. & Tripsas, M. 2007. The accidental entrepreneur. The emergent and collective process of user entrepreneurship. In: Strategic Entrepreneurship Journal 1 (1-2): 123–40. Smith, A., Hielscher, S., Dickel, S., Söderberg, J. & Van Oost, E. 2013. Grassroots Digital Fabrication and Makerspaces. Reconfiguring, Relocating and Recalbirating Innovation? In: SPRU Working Paper Series (2013-02). Online: https://www.sussex.ac.uk/webteam/gateway/file.php?name=2013-02-swps-aps-sh-gdf-working-paper.pdf&site=25. Smith, A. & Raven, R. 2012. What is protective space? Reconsidering niches in transitions to sustainability. In: Research Policy 41 (6): 1025–1036. Smith, A., Voß, J.P. & Grin, J. 2010. Innovation studies and sustainability transitions: The allure of the multi-level perspective and its challenges. In: Research Policy 39 (4): 435–448. Söderberg, J. 2013. How open hardware drives digital fabrication tools such as the 3D printer. Internet Review Policy 2 (2). Troxler, P. 2010. Commons-Based Peer-Production of Physical Goods: Is There Room for a Hybrid Innovation Ecology? 3rd Free Culture Research Conference, Berlin, October 8-9, 2010. Online: http://ssrn.com/abstract=1692617. Von Hippel, E. 2005. Democratizing Innovation. Cambridge: MIT Press. Walter-Herrmann, J. & Büching, C. (Ed.) 2013. FabLab of machines, makers and inventors. Bielefeld: transcript. Zuboff, S. 2010. Creating value in the age of distributed capitalism. Online: http://glennas.files.wordpress.com/2010/12/creating-value-in-the-age-of-distributed-capitalism-shoshana-zuboff-september-2010.pdf.